A few years ago, my friend Alex helped her sweetheart Brandon to open a brunch restaurant in Portland. They had too many customers. At 9am when they oened their doors, some days, there’d be a line of people creeping around the block. With a tiny dining room—just eight tables—they couldn’t possibly seat everyone at once. The waiting area became cramped and hectic. Often, customers had to wait an hour—or more—before they could sit down and order their meal. Alex noticed that most of the people in the waiting area looked extremely “hangry” (hungry and angry). Their eyes were glassy. They looked bored and disgruntled. They wanted waffles and bacon. Like, yesterday. Alex and Brandon came up with a plan. People feel bored? We’ll set up an area with Nintendo, books, coloring supplies, a chess board, and Tarot decks. They can entertain themselves for hours! People feel thirsty? We’ll put out pitchers of water, and we’ll sell them coffee that they can sip while they’re waiting for a table. People feel hungry? We’ll pass out teeny-tiny mini pancakes as a little snack. For free. Something to nibble on while they wait. That week, Alex and Brandon revamped their waiting area and made all kinds of changes. Customers LOVED it. They couldn’t believe how cool it was. “OMG, you guys have 400 Nintendo games? For real? !” The sour faces disappeared. The entire atmosphere in the restaurant shifted. People started playing games, talking, laughing, and enjoying themselves instead of grumbling. Brunch crisis: averted. 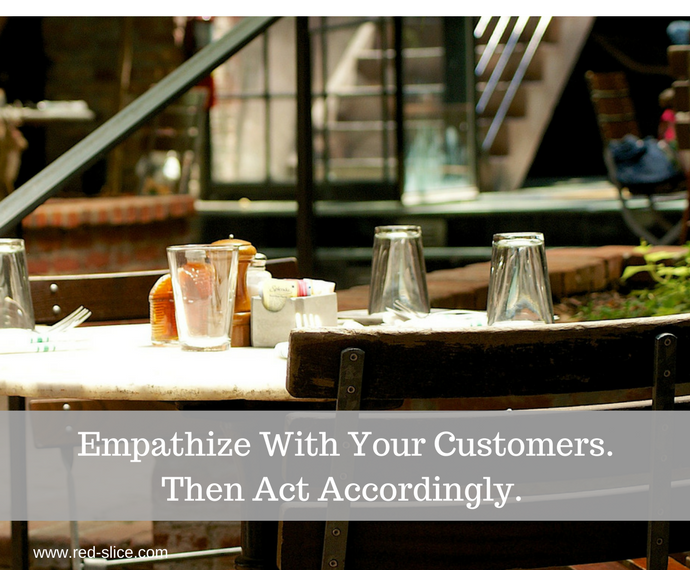 Really try to see—and feel—the situation from that customer’s perspective. Imagine their scenario. Consider what you’d want if you were in the same scenario. Then, design your business accordingly.